Techweek arrives in Los Angeles today, in one of its final stops of an 8 city tour across North America. Techweek is a week long event which acts as a catalyst to boost emerging tech ecosystems, and we have some exciting news to share with everyone! 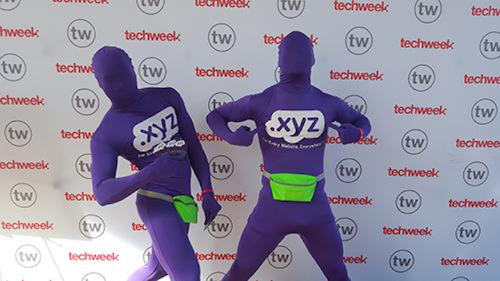 Our CEO, Daniel Negari and XYZ – are both being honored as recipients for the Techweek 100 awards, which are presented to “the most prominent tech leaders and innovators in the greater Los Angeles area”. Daniel was selected for the Ambassador award, which is only given to 25 industry leaders within the community. The Ambassador award is for those who have not only acted as positive representatives for their specific industries, but for the tech industry as a whole. Daniel stands amongst other honorees of this prestigious award including: entrepreneur Mark Cuban, the CEO of GM Mary Barra, and Marcelo Claure, the CEO of Sprint. XYZ, alongside companies like Oculus, Maker Studios, and SpaceX, was selected for an award in the Innovator category – reserved for companies who are shaping their industries with innovative new technology and forward-thinking ideas. We couldn’t be happier to accept these awards, and Team XYZ (and the #XYZsquad) will be attending Techweek here in Santa Monica. We look forward to meeting with all of the other honorees and attendees throughout the week. But that’s not all we have planned for November! XYZ will be holding a special sale with our registrar partners for Black Friday and Cyber Monday – and we have some amazing deals planned. Be sure to keep an eye out on our Twitter for live updates from Techweek, and for more information on our sale as the Black Friday and Cyber Monday weekend approaches. China Blog Series: SINGLE’S DAY FLASH SALE – 1RMB .XYZ domains for 24 hours only! In celebration of the Single’s Day holiday, our registrar partners in China are holding a 24-hour flash sale for .xyz domains – just 1RMB each on 11/11 only! As a truly generic and internationally recognizable domain extension, .xyz can be used for any and every purpose. Whether you’re building a personal page, launching a new startup, or expanding your business, .xyz is the platform for your to connect with the next generation of internet users all over the world. There are still many great domain names available, such as AliceLiang.xyz, LiZhenXing.xyz, HuoCheZhan.xyz, HaoXiang.xyz, Touziren.xyz and ShanghaiTours.xyz. There is also no limit to the number of domains you can register, so visit www.gen.xyz/cn/jingpin to see what 4L, 5L, and 6N .xyz domains are still available for just 1 RMB. Visit any of our registrar partners in China below to register your .xyz domains for just 1RMB on 11/11! Scan the QR code below or use ID: wwwgenxyz to add us on WeChat. Just over two years ago when our CEO Daniel Negari launched .xyz, he envisioned a future where entrepreneurs could build websites for their innovative ideas on memorable domain names. Since then we’ve seen the #GenXYZ community grow to include some of the biggest influencers in tech. This list now includes Massachusetts Institute of Technology (MIT), who was just featured in TechCrunch for this week’s #WebsiteWednesday: Engine.xyz. “It will supply the particular combination of resources they need to develop and bring to market innovations that address society’s most important challenges. We’re calling it The Engine. As a world renowned leader in developing breakthrough technology – with alumni who have founded notable companies like Texas Instruments and Intel – MIT plans to draw on $175 million in funding from the university and its investors to aid resident companies at The Engine. The venture currently occupies 26,000 square-feet of lab space on campus with plans to expand to over 200,000 square-feet. 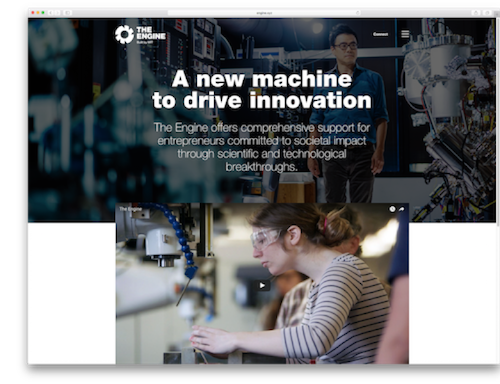 MIT has also established an online marketplace of specialized equipment, space, and services called the Engine Room. This marketplace acts as a network to connect Boston’s disruptive thinkers and gives them access to the tools and space needed to develop their technologies. MIT chose to use Engine.xyz because it speaks directly to the next generation that will be solving these global problems. It has created a platform for its students to bring their innovation to a global audience, just as others in the #GenXYZ community have done before them. With MIT now joining the .xyz ranks, it’s just a matter of time until more disruptors in the program introduce their ideas to the world using .xyz. You may have first read about Empati.xyz in our August blog post celebrating the Olympics. But with this past Saturday being National Cat Day, we decided to take a deeper look at a group that truly cares for cats and their canine counterparts. Empati (the Turkish translation for “empathy”) is an organization based in Istanbul that is saving the lives of the many stray cats and dogs in their city. By building homes, collecting food, and raising money for these animals, Empati protects strays from illness, starvation, and gives them the nourishment and care they deserve. 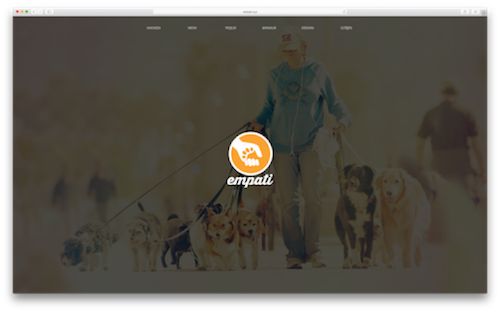 The well-being of stray animals is not a problem unique to Istanbul, and Empati uses their short, brandable .xyz URL to expand their influence worldwide. With this creative take on saving pets, Empati is inspiring #GenXYZ to care for animals who need a helping hand – or a loving ear-scratch. If you’re inspired by Empati.xyz’s work and want to make a difference with your own .xyz domain, head over to our Turkish partners Natro and Isimtescil to take advantage of their limited time sales! The longevity of a business, regardless of its age, relies on the ability to continuously innovate. In today’s fast-paced environment, businesses truly set themselves apart by expanding upon their initial idea and launching entirely new products and services. With the focus entrepreneurs have on their own vision, it can be easy to miss key opportunities to gauge how their product will be received in the market. Luckily for them, this week’s #WebsiteWednesday will make sure any business is ready to succeed as soon as their product hits the market: MindTheGap.xyz. Mind the Gap is a product development company that helps businesses reach their full potential by offering design consulting and market testing for products and services. With over 10 years of experience working on projects for clients like TomTom, Mind the Gap helps companies strategically develop ideas by utilizing a comprehensive design process. This process includes storyboards, UI flows, and concept testing coupled with market research, so their clients have the information they need to ensure a successful launch. 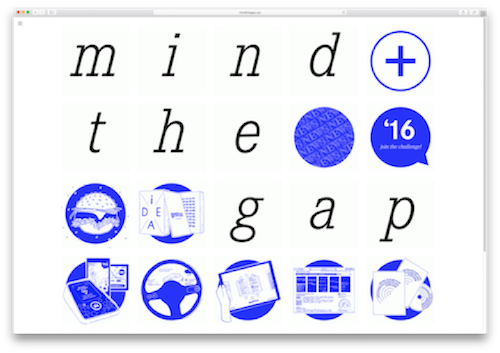 Mind the Gap also applies their innovative design strategy to their own original projects. One example is their Colorburgers project, which celebrates cultures from around the globe using one of the most common food items in the world: the hamburger. The first installment featured a burger inspired by the cuisine and culture of Angola, which gave event attendees a taste of the country while also educating them about its history and people. By identifying unsolved problems in the market and presenting creatively designed solutions for them, MindTheGap.xyz helps businesses and entrepreneurs bring innovative new tools into our everyday lives. Like XYZ, Mind the Gap supports companies with great ideas and helps share them with a global audience. It’s fitting they chose the only domain that matches their passion to connect people and ideas across the globe – .xyz. We are excited to announce that our exclusive themed auction with Chengdu West has officially wrapped! There were some great LLL.xyz, LLLL.xyz, and NNNN.xyz domains that sold for incredible prices, and we couldn’t be more pleased with the results. Some of the domains sold include TIE.xyz, OTA.xyz, and 1887.xyz, which sold for 3700RMB (~$550 USD), 3000RMB (~$446 USD), and 1400RMB (~$208 USD). Congratulations to the new owners of these rare domains! Scroll down to view more auction results. 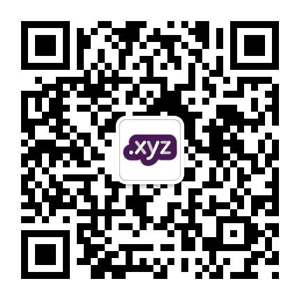 This surely won’t be the last themed auction that we have planned, so be sure to follow us on our newly-verified WeChat (QR below), official QQ (295605448), or verified Weibo account (www.weibo.com/genxyz) to stay up to date up the latest .xyz news from our office in Beijing. Singles’ Day is approaching so be on the lookout for some very special limited time offers on .xyz domains (hint hint) at Chengdu West. In the meantime, take advantage of the 4RMB sale that’s going on now at http://www.west.cn/domains/xyz.asp! Get insider tips by following Beijing XYZ’s verified WeChat account! As we continue our push to expand in China, we want to make sure that we keep everyone updated on the latest exciting .xyz news and events. That is why we are happy to announce that our Chinese business entity, Beijing XYZ Technology Co.LTD, is now WeChat verified! Follow our official WeChat account to read about everything below…in Chinese! Also, don’t forget to follow us on our official QQ account (295605448) and at www.Weibo.com/genxyz! Lastly, we are excited to announce that the first version of our Chinese website is almost ready. We will make an announcement in our newsletter once this is live. All of these initiatives are part of our plans to rapidly expand in China during the coming year. As we have said before, China is one of XYZ’s most important markets, which is why we are investing more money than ever to grow with our registrar partners in the region. 2016 has seen a host of futuristic technology making it’s way into our lives, from delivery robots to self driving cars. One of the most talked about emerging technologies already entertaining millions around the world is virtual reality. Our #WebsiteWendesday this week will give you a look at one VR company leading virtual innovation and catching the attention of some of the biggest names in tech: Rascali.xyz. 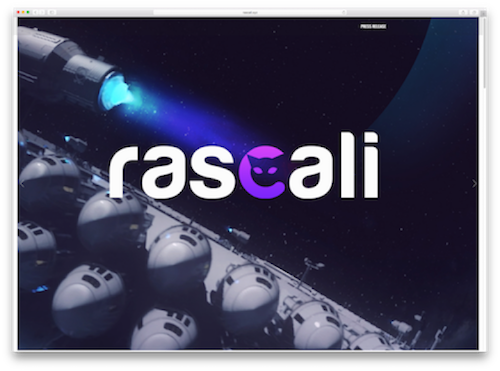 Rascali is a digital content studio that creates interactive virtual reality experiences used for marketing, employee training, and entertainment. Launched as the non-gaming division of VR developer Studio Roqovan, Rascali’s team of developers bring experience from projects with Marvel, Call of Duty, Dreamworks, and the NFL to build VR landscapes that connect users with the mission of their business through a custom-designed virtual world. One of our favorite Rascali projects is Woofbert VR. Created through partnerships with leading museums around the world, Woofbert VR allows users to tour virtual renditions of famous art galleries and, as CNN demonstrated, even go inside paintings to get a front-row seat to some of the greatest moments in history. Facebook featured Woofbert VR at their Oculus Connect 3 conference and called it “one of the pioneering experiences that is defining the future of virtual reality.” Rascali also announced in May that it had partnered with YouKu Tudou, one of China’s largest media companies, to release two narrative VR experiences on YouTube, Facebook’s OculusVR, Samsung’s MilkVR, and many other platforms. Like .xyz, Rascali is at the forefront of innovation in their field by creating platforms that help businesses engage with #GenXYZ. Just as .xyz is shaping the future of the internet, Rascali is shaping the future of the VR industry. If you’re inspired by Rascali and want to launch your own website with .xyz, you should head over to our partners at DreamHost who are having a limited time sale on .xyz domains! 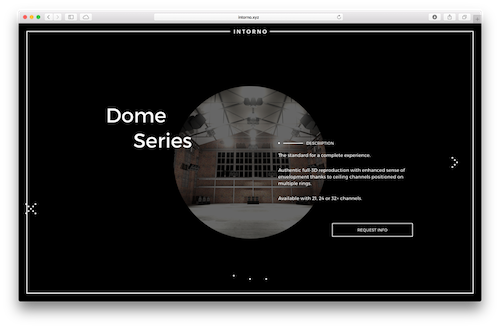 Intorno creates a 3D musical experience by allowing the audience to connect with the music around them through artist-controlled speaker channels. Sound moves and changes between the speakers to create a soundscape for the audience through the physical movement of the music. Intorno’s intuitive 3D technology is compatible with all professional speakers and is fully customizable, so artists can engage with every crowd like never before. Their most innovative tool is the control pad instrument, which is designed for the artist to control the 3D sound in the room. The 3D experience is created in real time by modifying audio levels being played through each speaker in the room. By giving artists the freedom to customize which sounds are coming from where, each audience is treated to a unique show. “We thought we could use this new domain extension to communicate even more who we are and what we do, alongside our brand name. Why pursue a traditional domain at all costs when it just doesn’t add any communicative value to your brand? That’s why, being a project that deals with 3D Sound, architecture and acoustics, we thought that the .xyz extension could add some visual support in communicating that yes, we are about coordinates, space and three dimensions. Intorno was able to secure the brandable, memorable domain they wanted with .xyz, while also appealing to their biggest market, #GenXYZ. Intorno.xyz is the perfect fit for a disruptive technology that’s changing the live music experience as we know it today.